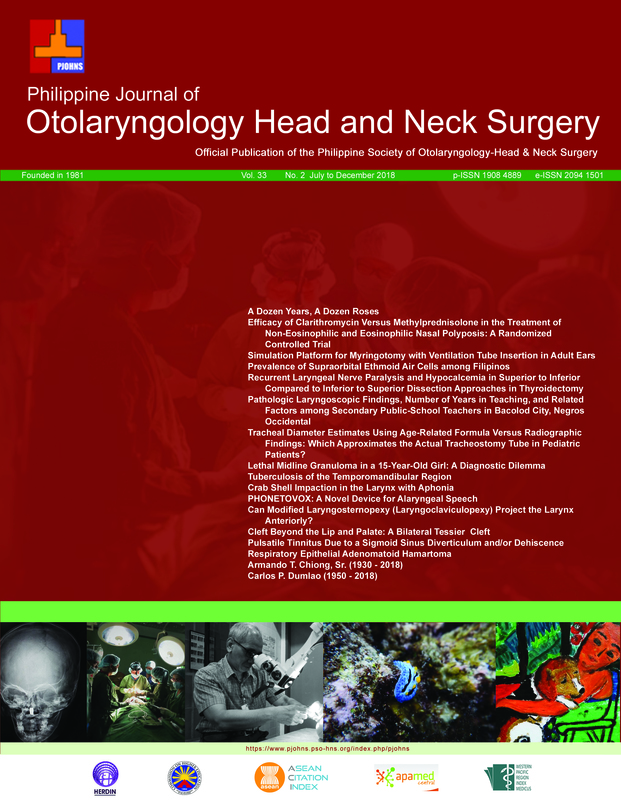 Objective: To determine the presence or absence of gross laryngeal or vocal cord pathology during endoscopic examination and determine if there is a relationship between these findings, the number of years in teaching, and the presence of other risk factors among teachers in a public secondary school in Bacolod City. Participants: A total of 50 school teachers participated in the study, conducted from July 2016 to May 2017. They completed a questionnaire on demographic data, professional profile, and lifestyle profile and underwent laryngoscopic examination. Results: The most common pathologic laryngoscopic findings were vocal fold nodule (12%), swollen arytenoids (10%), paretic vocal cords (6%) and epiglottic mass (6%). There was no significant relationship between laryngoscopic findings and number of years teaching (X2 = 0.103, df = 1, p = .748. However, there was a significant relationship between laryngoscopic findings, smoking (X2 = 6.419, df = 1, p = .011) and daily water intake (X2 = 10.208, df = 2, p =.006). Conclusions: Results of this study suggest that in terms of voice care, public school teachers may benefit from avoidance of smoking and increased water intake.